well you might have noticed the wire in the wing. I am running lights. I found 3mil and 5 mil LEDs at Radio Shack. The pack I got was an assortment of 20 for less than $3. The micro switchs were also less $3 the lights opperate on 5v with very little draw. I am using 30 gauge for the wiring. I tested these lights and they should stand out nicely. I looked at your site and it is nice, and I see great potential with the proposed sections to help people become builders by showing them how to do each step to see what they are in for. Kudos to you for your approach. I thought the lights would be nice. I always wanted one with lights. The Hellcat has a bunch of them also! should be neat! I am one of those guys that lights all the gadges hatchs and functional appendages on planes. Thanks for the kind words HellcatAce, much appreciated. I guess I may have to seriously consider making up an addendum to the plans showing installation of the flaps. Chad I think that adding a addendum to the plans for Flaps is a great idea and needed. It may not be needed to fly but sure adds to the cool factor plus like the Corsair the Hellcat looks mean with the flaps hanging down on landing. i glued the wing together today. there are laser cut saddles that come with the kits to support the center section during this process. slide together and block up the tips 3-3/4"
Gotta love those rockets Tighe. They look good. Just wanted to give everone a preview of the fuselage. No glue here. Like Ive said this thing tabs together. 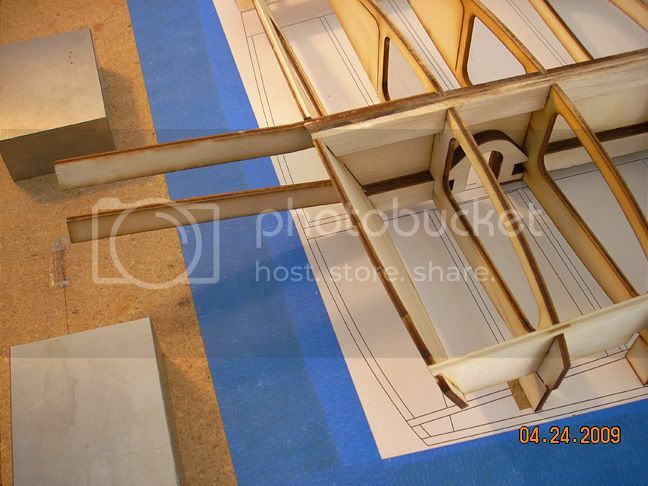 - once you get the fuse tabed together to the point in the pics, square everything and glue it before adding stringers. Just to clarify the middle stringer is the one that runs the length of the fuse. It also runs right above the wing saddle. A quick update for those guys waiting on kits. I ran into a few issues with the cowl plugs which I needed to rectify in order to achieve a quality part. I've got that done and hope to finish up the cowls and canopies tomorrow. Once that is complete there are a few minor wood parts to finish up and the kits will be ready to ship. If you ordered hardware your kits will not ship until the hardware arrives as previously discussed. This, of course, does not apply to local purchasers and I will get your kits to you as soon as the parts are done. I apologize for the delays but they should be done before the end of this week. Also, I would like to clarify that Tighe (Tko310) is working ahead of the group and without the aid of any instructions. This is a good thing in that he is finding any stumbling blocks or issues which I may have missed. Once the kits are delivered and the group build gets under way I will use the info gleaned from both my build and Tighe's build to put together a recommended construction sequence which will be covered step by step on the web site. So, lest anyone think that they are already falling behind, don't sweat it! What did you think of the tail wheels Chad? Thanks Randy for the info I will post pics of my tail wheel soon. Your welcome it is easy to do and really gives it a better look. Hi Chad, i think I figured out our 4" scale wheel problem. I'm not done with them yet, but you get the idea. These are for my Mustang, but they could easily be changed to be a Hellcat set. Hi Chad, i think I figured out our 4'' scale wheel problem. I'm not done with them yet, but you get the idea. These are for my Mustang, but they could easily be changed to be a Hellcat set. Very nice Aaron, tell me more! Are those the Violet wheels on a new hub? Another quick update on progress. As mentioned previously the wing joiner assembly was revised to be a bit beefier at the request of a warbird racing buddy of mine. The changes don't add any significant weight, provides for more strength, and may actually be easier to build than the previous design. As such I've decided to make it the standard since many of you are talking about bigger and heavier motors in your Hellcats. I already had a few kits made up to the old standard so I am in the process of cutting new parts for them and getting some new wing plans printed. This will keep everyone on the same page and make it easier on me because I won't have half the group building one wing and the other half building a different one. I am always a bit leary to send out anything that has not been prototyped to check for errors so I have started construction of a revised wing for myself. Below are two pictures which reflect the differences in the dihedral braces used to join the outer panels to the center section. The top photo is of the old design which had two relatively short 1/8" light plywood "blades" which inserted into slots in the outer wing panel ribs. The revised design, seen at bottom, uses a dihedral brace laminated from two pieces of 1/8" light ply. This brace has now been moved forward so that it is sandwiched between the two 1/4" balsa main spars and will be completely boxed in with light ply shear webs front and back. Should be relatively bullet proof. If you're still in doubt, the dihedral brace could be made from 1/4" aircraft grade ply for even more strength. yep, Violett tires with modified 1/10 scale rc car wheels Here is how I did it. Hey all did this thing die or what? no posts since 11-24. any body have any tips on building flaps? any pictures? Not dead at all, just getting started in fact! Kits have been shipped and should all be arriving with their respective builders in the next few days. An official "kick off" of the build should happen very shortly and I will start posting regular updates. I have a second "beta" builder here in town who has made significant progress on his Hellcat and I will post some pictures as soon as he gets them to me. The lack of thread activity has been due to the fact that I've had my nose to the grind stone trying to get the first run of kits finished which turned out to be a bit more challenging than I had hoped for! The next run of kits should (knock on wood) go much smoother. I'm looking forward to getting back to the finish work on my prototype and I have also started to frame a second airplane as well. I will most likely make an addendum to the plans showing the installation of flaps but it will have to wait until the group build is well under way and I have a bit more time to spare. I've been commissioned to do work on two other designs so my time is at a premium right now. Stay tuned guys, the exciting stuff is yet to come! If one of those designs isn't a P40 or "German" and soon to be available to the public, we'll tar and feather you.... 70+ wing sir!! Hi all I have made lots of progress on my planes as well. I will post pictures this weekend. I have also started mods and molds for a full cockpit for this plane. Not yet sure how it will all turn out but will be something to look forward to. Stay tuned.